My research and teaching explore problems at the intersection of ideas, politics, and markets in the United States and the Atlantic world since the late 19th century. I am also co-editor of the journal Modern Intellectual History, serve as an executive editor of the series Intellectual History of the Modern Age with the University of Pennsylvania Press, and am in the early stages of a project proposal to co-edit a multivolume Cambridge History of American Thought. I work with graduate students and teach undergraduate courses on a broad range of topics related to intellectual history, transnational history, and the history of capitalism; recent syllabi are available in full via the “Teaching” tab on this site. In 2016 I was a finalist for the Krieger School’s graduate teaching/mentoring award. I am especially proud of the accomplishments of my undergraduate and graduate students, who in recent years have won both the Butler Prize for the best first-year graduate paper and the Kouguell Prize for the best undergraduate thesis in the department. I am also helping to lead a working group for the Center for Advanced Study in the Behavioral Sciences at Stanford that seeks to develop new cross-disciplinary teaching platforms related to moral and political economy. Due to my leave schedule, I am not accepting new graduate students for the 2020–2021 academic year. “Politics and Economics: The Age of Entrepreneurship.” Forthcoming in Bloomsbury Cultural History of Ideas, 1920–present, ed. Stefanos Geroulanos. “Market Politics in an Age of Automation.” Beyond the New Deal Order, ed. Gary Gerstle, Nelson Lichtenstein, and Alice O’Connor (University of Pennsylvania Press, forthcoming 2019). “The Reinvention of Entrepreneurship.” American Labyrinth: Intellectual History for Complicated Times, ed. Ray Haberski and Andrew Hartman (Cornell University Press, 2018), 163–180. “New Directions, Then and Now.” The Worlds of American Intellectual History, ed. Joel Isaac, James Kloppenberg, Michael O’Brien, and Jennifer Ratner-Rosenhagen (Oxford University Press, 2017). “Laissez-Faire.” Encyclopedia of Political Thought, ed. Michael T. Gibbons (New York: John Wiley & Sons, 2014), 2039–2043. “Interchange: History of Capitalism.” Invited participant (with Sven Beckert, Peter Hudson, Louis Hyman, Naomi Lamoreaux, Scott Marler, Steven Mihm, Julia Ott, Philip Scranton, and Elizabeth Tandy Shermer). Journal of American History 101, no. 2 (2014), 503–536. “Age of Certainty: Galbraith, Friedman, and the Public Life of Economic Ideas.” History of Political Economy, special volume on 'The Economist as Public Intellectual,' ed. Tiago Mata and Steven G. Medema (Durham: Duke University Press, 2013), pp. 191–219. “The Political Ambiguities of Neoclassical Economics.” Research in the History of Economic Thought and Methodology, ed. Biddle and Emmett, v. 31a (Bingley, U.K.: Emerald, 2013), 217–224. “The Radical Conservatism of Frank H. Knight.” Modern Intellectual History, vol. 6, no. 3 (November 2009), pp. 513–538. Interview with Marketplace Tech, NPR, November 2016. "Contra Keynes," Wall Street Journal, November, 8, 2015. "Dangling Man," Dissent, Spring 2015. Keynote presentation on "Hayek, Friedman, and the Return of Laissez-Faire" at the Hoover Institution, June 2014. 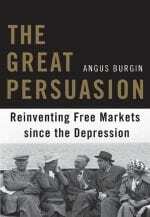 Discussion of The Great Persuasion with Harvard University Press. Discussion of The Great Persuasion on EconTalk. Discussion of minimum wage legislation on WYPR. Post for the Society for U.S. Intellectual History on "The Futures of American Intellectual History." Discussion of The Great Persuasion with Chris Gondek of the "Invisible Hand" podcast, available on iTunes. Discussion of The Great Persuasion with John Miller of National Review, available at the "Between the Covers" podcast website or on iTunes. Interview with Foundations, vol. 7, no. 1 (Fall 2013). "Hayek Lecture" at Duke University, on the Mont Pelerin Society and the postwar transformation of ideas about free markets: available at YouTube. Keynote address on The Great Persuasion: available from the Center for Ethics at Muhlenberg College. Presentation at a panel from the 2010 Organization of American Historians on The New Intellectual History of Conservatism.